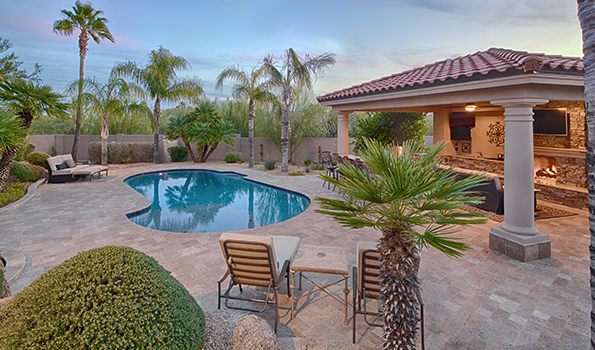 Outdoor living is one of the best features of growing up in the valley. Kids enjoy over 300 days a year of great weather to enjoy being outdoors and being active. And parents are glad to invest in kid friendly features like a custom swimming pool, artificial turf, sports courts, sunken trampoline pits and splash pads to keep their kids entertained and exercising. But don’t forget that hard working parents need an outdoor oasis too. Talk to a UNIQUE designer today about adding a quiet space for you to relax and enjoy some time outdoors. A small patio set away from the hustle and noise of the play area is a must for every parent. A ramada or other patio cover will provide enough shade for a few lounge chairs and mister system will make it the perfect escape even in the heat of the summer. You are close enough to supervise the play area but far enough away to avoid being splashed, spilled on or asked to fetch a ball, a soda or anything else the kids want. This adult outdoor retreat can also be a great place to sit and enjoy a good book, listen to some music or even take a nap. It is great to have a kid friendly yard and the security of knowing that your kids are safe and having a great time, but parents need some time to relax and unwind. An outdoor living space for parents is the perfect way to forgo on the high cost of building a man cave or she shack without having to give up the concept of a quiet place for adults to relax and recharge. Contact a UNIQUE designer today to learn about all of the great features that can be included in your outdoor retreat. A self-cleaning pool would be every pool owners dream. After all, you have a pool to enjoy swimming, not cleaning. But there will always be a certain amount of attention a pool requires, just as a car or even your home required some maintenance. But an in-floor cleaning system can greatly reduce the time and effort that you will need to invest in your pool, making it much easier to jump in for a quick swim after dinner or to enjoy a leisurely soak on the weekend. Especially as the temperatures in Phoenix heat up, thoughts of relaxing on the beach become even more appealing. But it can be hard to carve out the time to get the entire family together at the beach even for just a long weekend. So a good substitute is bringing that beach feel and fun right to your UNIQUE backyard. As the owner of a UNIQUE swimming pool, you already have the one critical feature needed for a great beach style staycation, a magnificent pool. So now you just need to add a few more of the attractions and amenities that you find at the beach. 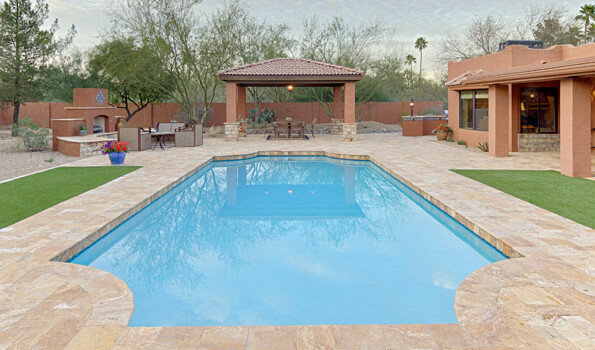 A Shade Umbrella- Having a way to add a little shade to your pool area will certainly make it more relaxing. 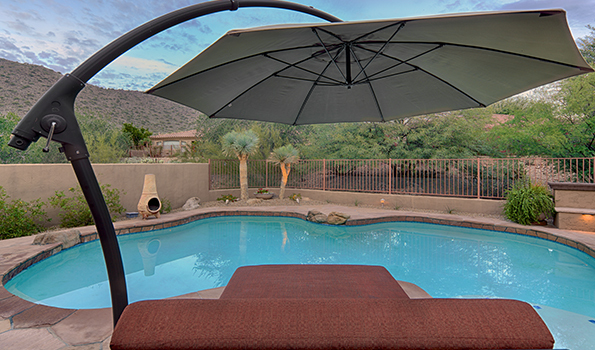 A shade umbrella can easily be inserted into the sleeves near your pool that are used for a volleyball net. Cold Drinks- If your family has a favorite drink when at the beach, then be sure to have some on hand for your staycation. This could mean making a huge batch of fruit smoothies, nonalcoholic frozen drinks or getting a special type of soda. But this small extra effort will help to make your staycation special and not just feel like another day in the backyard. Special Snacks- Again, making a little extra effort to create a fun and UNIQUE menu will add to the fun of your staycation. This could mean making fruit trays and stashing them in the fridge for a mid-day snack or even making special popsicles with berries in them for the kids. And don’t forget how much everyone enjoys making s’mores after a long day at the beach. You might need to substitute your grill or fire feature for the natural fire pit on the beach but that won’t change how great the s’mores taste! Beach Games- If you find that your family is very active at the beach but just sits around in the backyard, try to bring some of the fun beach style games to your backyard. Frisbee, paddle ball and corn hole are all fun for the entire family and can encourage that competitive nature to get everyone more active.